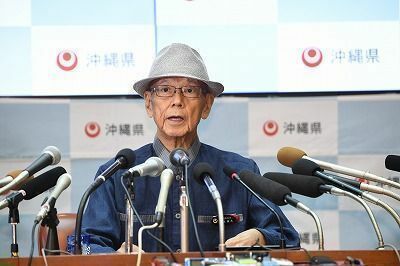 On July 27 at the Okinawa Prefectural Office, Governor Takeshi Onaga announces that he will revoke his predecessor's approval of the land reclamation permit related to the replacement facility for Futenma Air Station being built in Henoko. On July 27 at 10:30 a.m., Governor of Okinawa Takeshi Onaga held a special conference at the Prefectural Office. Regarding the replacement facility for Futenma Air Station being built in Henoko, Onaga announced that he will revoke his predecessor’s approval of the land reclamation permit. He publicly indicated that he is pursuing revocation procedures. The Okinawa Prefectural Government’s first steps in these procedures are to hold a hearing with the central government doing land reclamation work in Henoko, and to notify the Okinawa Defense Bureau (ODB) of the hearing. The Okinawa Defense Bureau has informed the Okinawa Prefectural Government (OPG) that if things go quickly land reclamation work will begin on August 17. Onaga will use the best of his administrative authority to block soil deposits in the ocean area of Henoko. At the beginning of the conference, Onaga criticized the Abe administration’s stance. Onaga said, “The U.S. and North Korea are continuing efforts toward denuclearization of the peninsula and easing tensions. I cannot approve of the Japanese government’s stance, coercively pushing forward with the Henoko replacement facility plan decided upon over 20 years ago. Regarding the construction work that is currently being moved forward, he explained, “I think it is insolent the way construction is being conducted. Construction was moved forward without environmental conservation measures or even preparing prior consultations.